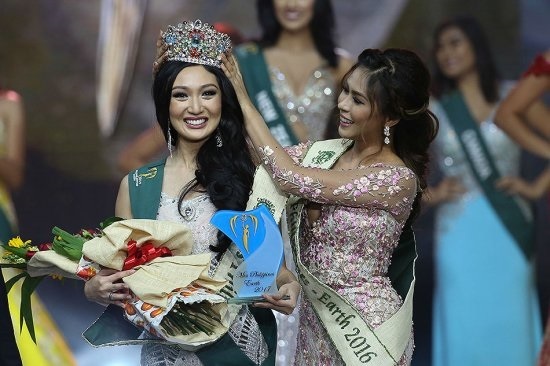 A medical physicist from Manila was named Miss Philippines- Earth 2017 during the coronation night at the SM Mall of Asia Arena in Pasay City on Saturday evening. Karen Ibasco, who bested other 39 contestants, will represent the country in the Miss Earth international pageant later this year. During the competition's final question and answer portion, she was asked what change she wants to see in national environmental policies. Jessica Marasigan from Caloocan was crowned Miss Philippines- Water while Kim de Guzman from Olongapo was named Miss Philippines-Air. Vanessa Mae Castillo from Lobo, Batangas, hailed as Miss Philippines-Ecotourism and Nellza Bautista from Villanueva, Misamis Oriental, was announced as Miss Philippines-Fire.